This article is a continuation of a previous one, Control an A.C Light Bulb Over The Internet from a Smartphone. This time we would use the Blynk Cloud platform to control the built in LED over the Sim800 module GPRS connection. NOTE: SIM800 USES A MAXIMUM OF 4V AND MINIMUM OF 3.6V, DO NOT EXCEED. 4V lithium ion battery, here + battery holder, here. We will be using Blynk app to control the LED over the internet. I showed you how to set up Blynk and create a button, if you missed it you can check it out here. For the purpose of this tutorial, we would be using the button we created. If you’ve set up Blynk successfully which entails getting your AUTH TOKEN, you can move to the next step. Connect the Vout +ve and Vout -ve to the +ve and -ve of the Sim800. If using a power pack and regulator, turn the rheostat till the output reads 3.9v. If using a battery, ensure the voltage is more than 3.6V else the Sim800 will not connect to a network. Change the auth token to what you got in Step 1. Change the Software serial tx and rx pin to 7 and 8 respectively. Tap on the button and watch the LED on your Arduino Nano come on an go off. 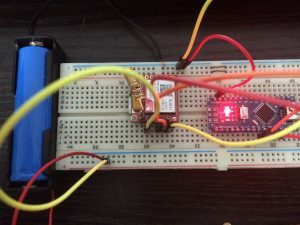 The amazing thing is, you don’t need to connect the microcontroller to a Wi-Fi network. You can connect this to a relay and setup a garage door opener.